WILLEMSTAD - In connection with its ongoing brand promise ‘It’s All About YOU’, RBC Royal Bank regularly hosts events that honor and celebrate its clients and partners. 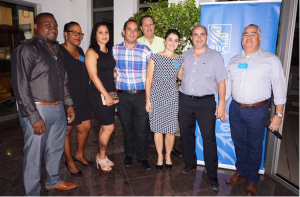 Recently, the bank held an appreciation event for car dealers, real estate agents and notaries on Curaçao. The event was the ideal setting for honoring and celebrating RBC’s business partners. Autocity B.V.’s Poppie Cratz was the sales person with the most referrals to RBC in 2015 and was awarded the ‘Best Sales Referral 2015’, while the Universal/Global Motors sales team was recognized for having the most total referrals in that year. RBC congratulates them with this achievement and thanks all its partners for the opportunity to do business with them. Among the attendees were all car dealers, real estate agents and notaries that do business in Curaçao. The event was a unique opportunity for the RBC Personal Banking and Business Banking teams, its Merchant Sales Officers and Investment advisors to build on existing relationships and establish new ones in an informal setting. “We are very grateful for our existing partnerships with many prominent members of our local business community. We would like to take this opportunity to thank you for doing business with us and we look forward to continuing and deepening our partnerships and forging new ones in 2016,” said Pierrot Hurtado, RBC Country Manager for Curaçao and Bonaire. Those who attended the event expressed to have really enjoyed the evening. By working closely with business partners, RBC is able to fulfill its promise to help clients thrive and communities prosper. RBC has consistently organized appreciation events on a regular basis and they look forward to yet another opportunity to host another event.